Jeff has been doing outpatient therapy since he got out of inpatient hospital, but started in a local rehab program at The Perfect Step or “TPS”. When he started in the TPS program in September. Jeff had thought that he had reached his physical capacity at other outpatient centers and was looking for more out of his recovery, so he decided to come to TPS after he had heard about TPS from a client in the program. 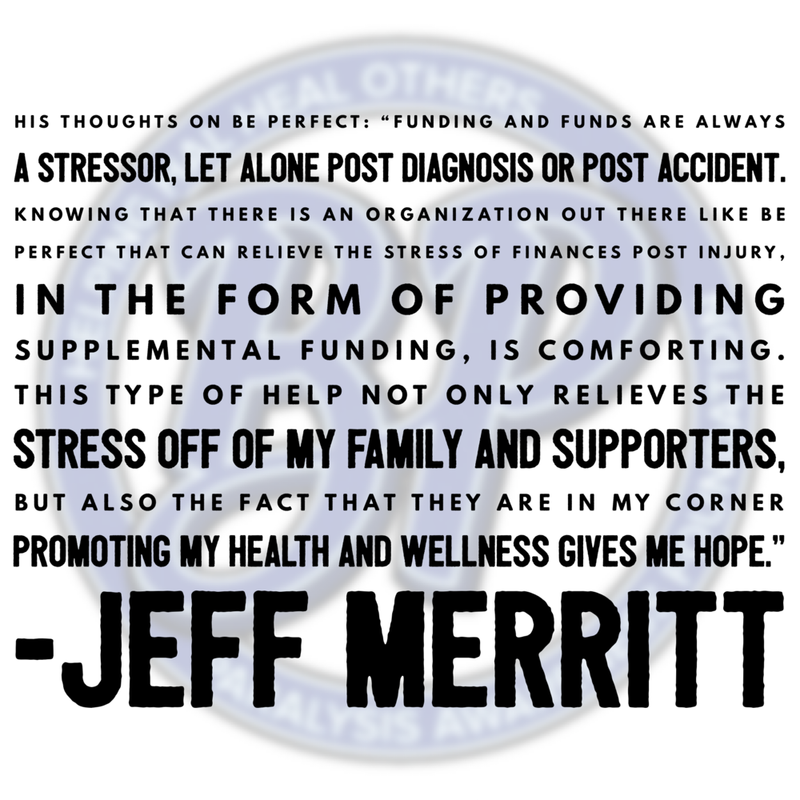 Since starting in the program TPS, Jeff has seen changes in his strength in his lower legs, and his personal confidence, namely because he does not need to use his AFO’s outside of the building any longer. “Since starting in the program at TPS in September (four months ago), I have already seen increase strength, stamina, health and mental stability. It has completely altered my perception about having hope for the future. TPS has taken my recovery to another level.” Jeff has even started to take steps in a walker on his own. Because of these positive changes, Jeff has made more of a commitment at home to continue his recovery regimen to help expedite the process of his recovery when he is inside the walls at TPS. When Jeff initially got injured, he will tell you that he had moments of thinking that he lost control of his life and that there was a lot of negative thoughts coming into his head. Jeff is surrounded by three incredible women in his life: his wife Sally, his daughter Kenzie, and his daughter Savannah. Jeff’s life is different now since the dark day shortly after his accident, as he will tell you his doubts are now gone. He believes that there is a bright future ahead of him. His accident was a huge test to his psyche and his heart. He believes that this is all one big test that he hopes he can pass. Jeff had a perception of what he thought his life would be after his accident and his actuality has far surpassed it in a positive way. Are you compelled by Jeff story? Donate to him by clicking on the link above. You can support his recovery in the biggest way possible!